How do bats cross a motorway? I got the chance to take part in a survey organized by two local bat groups, Plecobrux & Vleermuizenwerkgroep Brussel in Brussels two weeks ago to answer this interesting question. In the East – South-East of Brussels lies a very large forest called the “Forêt de Soignes“. Now mainly populated with beeches and oaks, it has been classified as a Natura2000 site because of the many species of bats living in the Forest. Unfortunately, in the 60s and 70s, with the boom of car industry, it became necessary to build a large ring road around Brussels, called “The Ring” (in red on the map), which cut the Forêt de Soignes in two. The Eastern entrance of Brussels is made through a large motorway, the E411 (in yellow on the map). 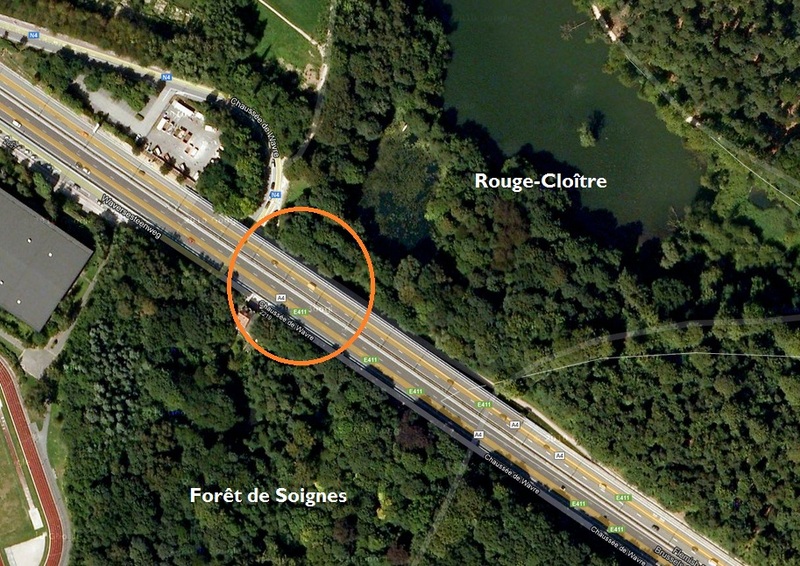 This bridge is particularly interesting because it divides a forested zone (on the left side of the panorama pic), and a less forested zone with large artificial ponds, the Rouge-Cloitre (on the right side). We started surveying at 22:00, and immediately noticed a lot of activity, with up to 9 passings per minute. Most of the bats seemed to come from the ponds (we called it the “OUT” direction), rather than from the forest (the “IN” direction). They usually circled a few times under the bridge to hunt, before going back to the ponds or moving to the forest. The cars driving on the bridge make a lot of noise, but this does not seem to disturb the bats hunting there. Here is a bit of bat audio, enjoy! You can hear some “bzzzz” (the feeding buzz, each time the bat catches an insect). Then, at 22:15, the lights went on, as you can see on the panorama pic. 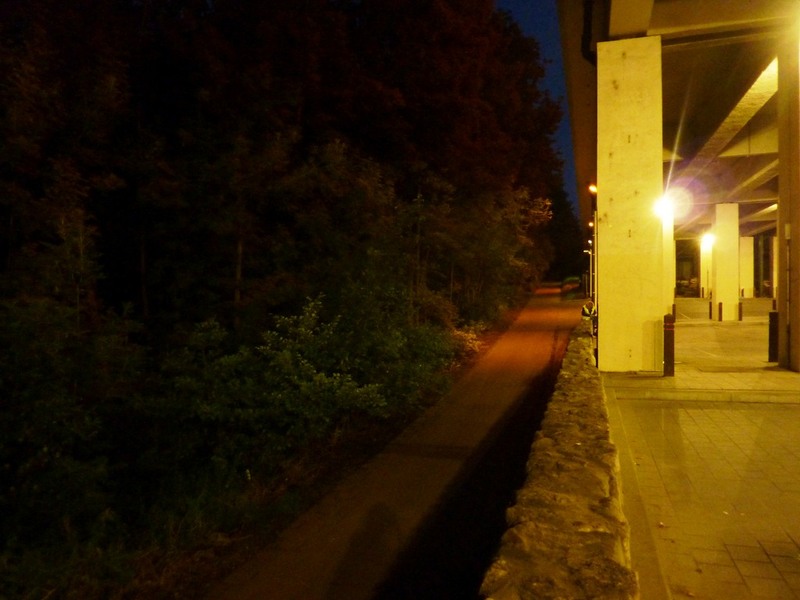 Since the space under the bridge is used as a parking, the lamps are large and bright spotlights. As soon as the lights went on, the detector remained silent. 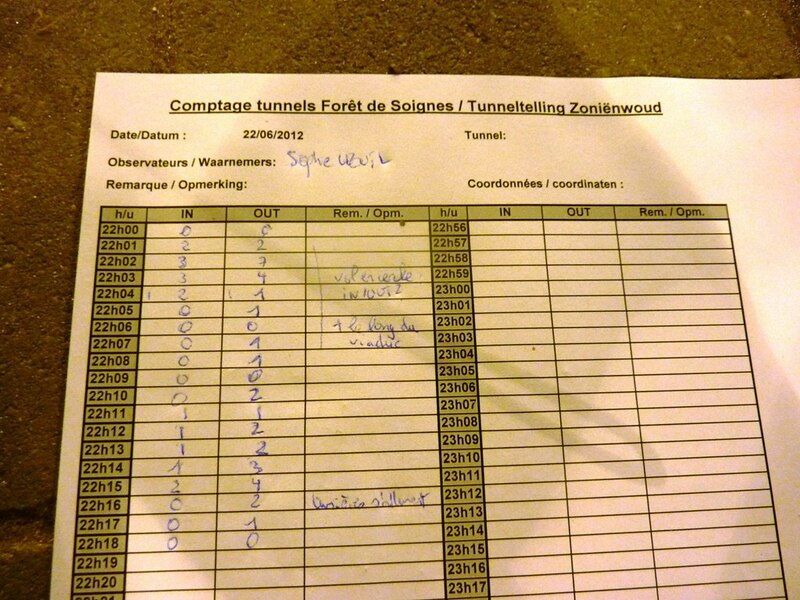 From 22h15 to 22h45, we only got one or two contacts, but it might have been of bats flying along the tunnel, not crossing through it. The senior bat ecologist decided to change plans, and to evaluate if bats were still hunting or flying along the tunnel, despite the lights. We moved to the left side of the tunnel, close to the ponds. 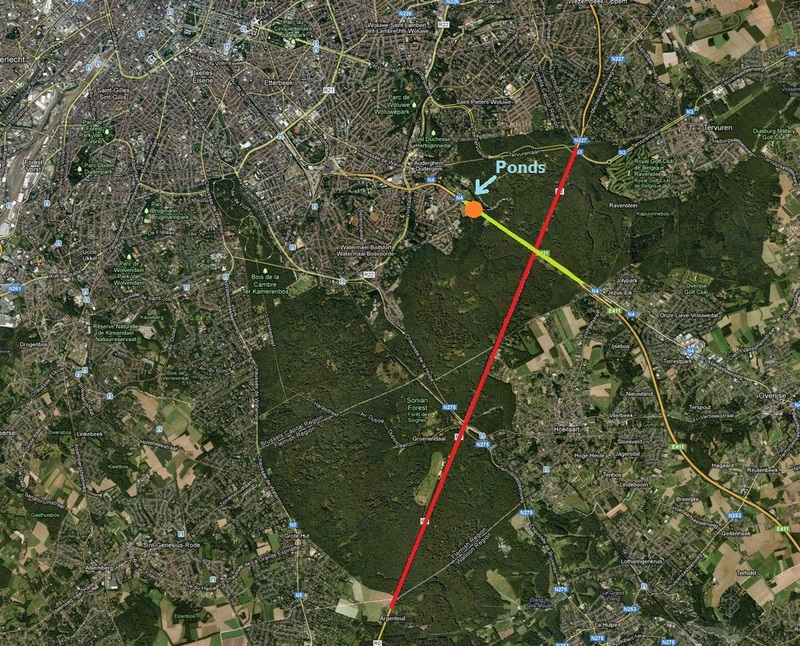 We observed a clear gradient : the further we moved from the city (the closer we got to the Forêt de Soignes), the more bats contacts we were able to make. In the tunnel, we only heard the common Pipistrelle (Pipistrellus pipistrellus), which uses frequencies of 45-50 kHz. The senior ecologist also detected Myotis sp. (mouse-eared bats) species near the ponds. At the end of the night, each team reported its results. The number of contacts and species of bats was very different between the teams, but there were big differences between the tunnels too (some were large, lighted, with a concrete ground, some others were rather small, dark, with bare soil). Overall, it seems that the lights have a negative effect on bat feeding. It is not rare to see bats flying around streetlights in the night, the argument being that streetlights attract nocturnal insects like moths….as a consequence, we might think lights are a good thing for bats! However, this statement is only valid for a few species like the Common pipistrelle (Pipistrellus), serotine (Eptesicus) or noctule (Nyctalus). Other bats tend to avoid lights (which is almost impossible in urban environments). In the case of our tunnel, even the Pipistrelles stopped flying when the lights went on! The lights might have been too bright or too hot. Besides, the fact that the lights were close to the tunnel ceiling might have prevented insects from flying around and above them (and indeed, we couldn’t see many moths or flies in the tunnel). Previous Post Urban ponds – wet and wild! What a wonderful project – I hope the study’s results lead to positive changes to protect bats! I live in Vermont in the northeast U.S. where there are almost no bats left because of white nose syndrome. For the most part, we didn’t appreciate our bats ’til they were gone. That disease is so awful, let’s hope the scientists can find a cure before it’s too late, or at least prevent it from spreading too far in the US. Even here in Europe, bats have long been ignored or feared, and their numbers have dropped drastically….fortunately, more and more projects like this one are launched to understand more about bats, and to protect them. This is a pretty cool study! We have noticed similar things over here; we have seen pips flying around streetlamps, but bright lights have been thought to confuse bats on the main part, as they a nocturnal by nature anyway. Look forward to reading the results! We weren’t expecting such a sharp stop when the lights went out…we thought that maybe the bats would at least continue to cross through the tunnel. I know there has been a lot of research recently regarding bats and lighting, and I can understand why!